“‘May the force be with you” while you fill up your Ereaders. Cynthia Woolf was born in Denver, Colorado and raised in the mountains west of Golden. She spent her early years running wild around the mountain side with her friends.Their closest neighbor was one quarter of a mile away, so her little brother was her playmate and her best friend. That fierce friendship lasted until his death in 2006.Cynthia was and is an avid reader. Her mother was a librarian and brought new books home each week. This is where young Cynthia first got the storytelling bug. She wrote her first story at the age of ten. A romance about a little boy she liked at the time.She worked her way through college and went to work full time straight after graduation and there was little time to write. Then in 1990 she and two friends started a round robin writing a story about pirates. She found that she missed the writing and kept on with other stories. In 1992 she joined Colorado Romance Writers and Romance Writers of America. Unfortunately, the loss of her job demanded the she not renew her memberships and her writing stagnated for many years.In 2000, she saw an ad in the paper for a writers conference being put on by CRW and decided she’d attend. One of her favorite authors, Catherine Coulter, was the keynote speaker. Cynthia was lucky enough to have a seat at Ms. Coulter’s table at the luncheon and after talking with her, decided she needed to get back to her writing. She rejoined both CRW and RWA that day and hasn’t looked back.Cynthia credits her wonderfully supportive husband Jim and the great friends she’s made at CRW for saving her sanity and allowing her to explore her creativity. Abigail Black, an heiress from Memphis is on the run from her abusive boyfriend, Dallas. In the process she finds she is being pulled towards something, and someone, that she thought only existed in her dreams. Another page turning adventure from Elizabeth Loraine. 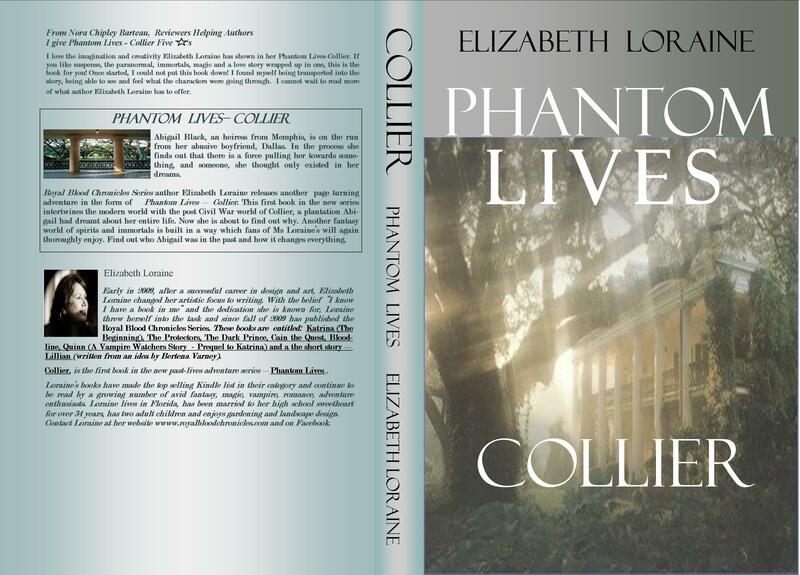 Phantom Lives intertwines the modern world with the post Civil War world of Collier, a plantation Abigail has dreamt about her entire life. Now she is about to find out why. 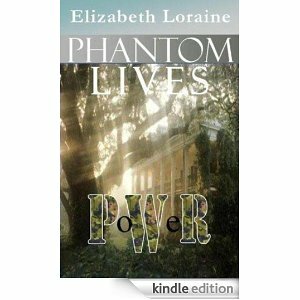 Another fantasy world of spirits and immortals is built in a way which fans of Ms Loraine’s will again thoroughly enjoy. Find out who Abigail was in the past and how it changes everything. I started writing this new vampire series for teens and their moms because I myself wanted something different to read. I was tired of all the modern versions of vampire books, there had to be more to these long lived beings. Where had they been what had they seen? I wanted, no I NEEDED to know more so Royal Blood Chronicles was born! As in Royal Blood Chronicles, Phantom Lives features strong female characters and action and adventure mixed with romance, friendship and a historical backdrop. 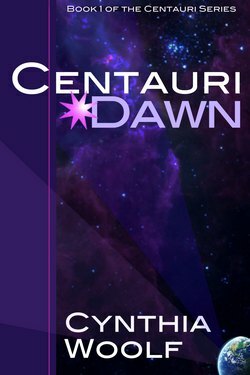 Finalist, Science Fiction/Fantasy, 2011 Next Generation Indie Book Awards. I am a scientist by training and vocation. I received a BA in Physics from Cornell University, followed by a Ph.D. in Astronomy from the University of Massachusetts. After graduation I went to work for NASA at Goddard Space Flight Center in Greenbelt MD. My work was primarily in the development of computer models to simulate the chemistry of the Earth’s atmosphere in order to understand ozone depletion and climate change. After thirteen years I left NASA and joined a consulting firm in San Rafael CA, working mainly on air pollution issues for the EPA. By then I was irrevocably committed to the use of computers and the development of software. In 1999 I left the environmental field entirely and became involved in developing software for biotechnology and medical applications, which I continue to do part time. Starting in 2002, however, I decided to pursue another interest, that of writing fiction. I continue to live in the San Francisco Bay area, still married to the same person after thirty-seven years. We have two grown children. It was a flash in the moonlight, a blur of motion like I’d never witnessed before. No human had the capacity to move like that. When I found myself face-to-face with him there in the meadow, I knew that the journal was authentic. I knew that my grandfather hadn’t been crazy at all. Because a foot away from me stood a vampire. Sarah Wood reads her grandfather’s journal in stunned disbelief. What was once her grandfather’s responsibility has passed to her father and now to her. She has become the Warden. Her life will never be the same. S.J. Wright (aka Steph) first began writing stories when she was twelve years old. All her stories at that time were about girls who had horses. She didn’t have horses. Steph became the neighborhood pest. After raising one son as a single working Mom for eight years, she met her husband. Those stories about girls with horses faded into the background. In 2005, Stephanie and her husband discovered that the baby she was carrying had spina bifida. At that point, she became the full-time caregiver to a teenager with ADD, a baby with a severe birth defect and a needy and hyper Jack Russell Terrier. When she would begin to talk to her teenager about what he’d like to do with the rest of his life, I was reminded of the dream from my girlhood. Well, there were really two big dreams back then. I wanted to write books that people loved to read. And I wanted a horse of my own. Last year Abigail Black’s life was turned upside down. Her parents were killed, her abusive boyfriend was chasing her, and she found out that the place she had been dreaming about since she was a small child was real. A Civil War plantation – Collier. It’s a magical place, guarded by Immortal’s who also haunted her dreams. Now she knows why. She’s a Keeper, those who are chosen to guard the Gates, the portals between time and space. This year with a brand new family, new Gates and Keepers are being revealed. And treasured artifacts must be saved. There have always been those who wish to control the Gates for their own purposes. This time Abbi is confronted not only by an old enemy, but an unexpected new one. Now she and Bill, along with Abbi’s Sentinel’s Tommy and Lizzie aren’t sure if they can win this battle. Follow Abbi on another incredible journey, full of magic, intrigue and shocking surprises as she battles evil in order to protect the Gates and those that are destined to protect them. This looks so cool! I’d love to give this a read! Sure thing, Greg…which Ereader do you have? And we’ll gladly Gift Copy you! Sweet!! I never win stuff! I’m gonna go get a lottery ticket!! I use the Kindle app on my laptop. Awesome reads for my Kindle…would love to win.